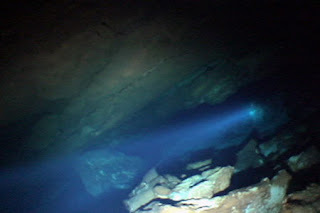 deepest underwater cave in the United States at 403 feet. Weeki Wachee's depths and beauty humble researchers. It's a world of sapphire blue, with boulders as big as houses and passages wide enough to accommodate a jumbo jet. To a diver who has explored the deep, naturally formed Weeki Wachee Springs, there's one word to describe being 403 feet down. "Humbling," said Brett Hemphill. "When you're that deep, you might as well be between the Earth and the moon." As part of the Tampa's Karst Underwater Research team, Hemphill, 40, and 19 other divers have confirmed that the home of the world-famous mermaids is indeed the deepest spring in the United States. "Some of the rooms were so large that I had to focus on one wall and make sure my compass was pointing the right way," Hemphill said. "There were sections where you could see formations that looked like piles of bones." Though the spring water is mostly crystal clear with visibility of about 100 feet, below 350 feet it becomes a deep, rich blue. The water at that depth, Hemphill said, has not gotten light of any kind for perhaps hundreds of years. After a first dive in late May, divers by July had found a dip in one of the five tunnels they explored. According to Jeff Petersen, president of the not-for-profit Karst group, they figured this would lead them past the 400-feet mark. With drought conditions dropping the usual flow of water through the springs by half, to 97 cubic feet per second, it was just a matter of time before the group explored what Petersen called the "coveted crown jewel" of Weeki Wachee. "We think it's deeper than 403 feet," he said. "But we're waiting until the waters drop down again. There's a wealth of exploration yet to be had." Recent rains that have eased dry conditions on land have increased the flow in the springs to about 125 cubic feet per second, too strong for divers to withstand. Last month, they were able to drop into the cavernous underwater world because the flow dissipated in the broad caves. But even then, Petersen said, forging their way into the caverns was like hanging onto a flagpole in hurricane winds. Once inside, divers used torpedo-looking, snub-nosed scooters and lights to go as deep as they could. They've explored about 7,000 feet of tunnel, nearly a mile and a half of rocky terrain. Researchers still believe the Weeki Wachee cave system is connected to another one known as Twin Dees Spring, located southwest of Weeki Wachee. Karst divers have tracked more than 2,000 feet of passages in Twin Dees Spring, about 200 feet deep in some places. With a special permit from the Southwest Florida Water Management District to explore Weeki Wachee Springs and with consent from the attraction's management, Petersen said his crew will be eyeing water levels, ready to jump back into the springs as soon as the water flow goes down again. The crew will also need to retrieve a few emergency dive tanks that got stuck down in the caves when rain restored the current. "This really is amazing," Petersen said. "But to me, what's even more incredible is the beauty of the system. All of these caves across the state of Florida are like people. Each one is unique with its own type of rock and formations. Weeki Wachee is one of the few that are so big and majestic. It's on the Grand Canyon level."